Is it time for you to move close to the Las Vegas Strip? Since there aren’t a ton of apartments right on the Strip (with all those darned casinos in the way), I’ve put a list together of nearby properties that are just a few minutes from all the pleasures Las Vegas has to offer. 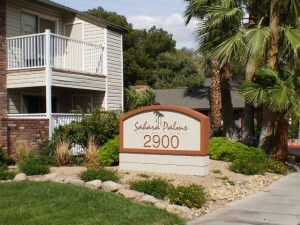 Lovely, quiet, and right in the heart of the city, Sahara Palms has great rent rates with 1 – 3-bedroom floor plans ranging from 680 – 1,444 square feet. The units have large walk-in closets and great linen closets, plus the location is incredible. This complex often runs specials to help ease the transition into your new home. You’ll find pretty much anything you need within a mile of the complex: restaurants, Starbucks, groceries, schools, Baskin Park, and a used book store. The Willows have well-maintained grounds and are a great place to live. The interior design in the models, office, and club house are spectacular and will inspire ideas for how you can decorate your own new home. You’ll find 1 – 3-bedroom units here sized between 766 – 1,200 square feet. The complex is close to Dad’s Grilled Cheese, Roberto’s Taco Shop, a Starbucks, schools, grocery stores, ethnic markets, P T’s Pub, a movie theater, and more. Offering 1 – 3-bedroom units ranging from 770 – 1,172 square feet, The Retreat has easy access to all the important sections of the city: the Strip, UNLV, medical centers, and more. The pool here is gorgeous and the lawns look like they were in a magazine — I don’t know how they keep them so green. Here are a few local amenities located within a mile of the complex: Olive Garden, Dunkin’ Donuts, Albertson’s, an elementary school, Las Vegas-Clark County Library, and even some banks and bars. Regardless of whether you’re moving close to the Strip for business or pleasure, the complexes listed here will certainly bring some joy to your life. Plus, these Las Vegas rental properties are also close to many local amenities so you’ll be able to walk to half of the places you go. Get some exercise, it’s good for you. Happy apartment hunting!